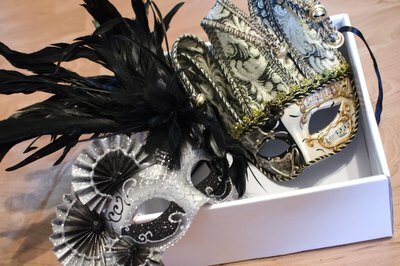 A masquerade party is a fun chance for people to socialize while hiding behind playful disguises. Masquerade costumes differ from other costumes because they require a mask to cover all or part of the face. Masks can be fixed to one's head or carried on a stick that the party-goer holds up to his face. 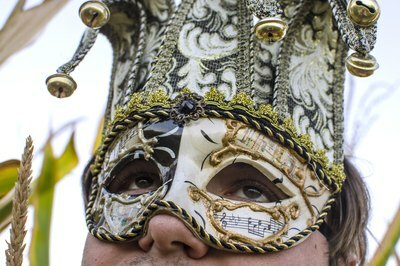 Halloween, Carnival, and Mardi Gras are known for masquerade parties, but you can have your own masquerade any time of year. The Phantom, from Andrew Lloyd Webber's "The Phantom of the Opera," is one of the most recognizable and traditional masquerade costumes. Throughout the play, the phantom wears a white mask over most of his face; he is usually dressed in a suit with a cape. The opera even features a ball and the musical number "Masquerade," in which all cast members wear masquerade costumes. Mardi Gras masks are fun and beautiful. They come in a variety of styles but usually play on a harlequin theme. Feathers, jesters and diamond prints are traditional Mardi Gras themes. 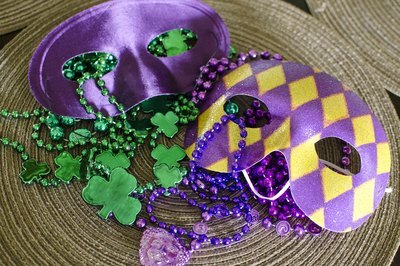 The Mardi Gras colors--green, purple, gold and black--are incorporated into many designs. Winged creatures make good masquerade costumes, perhaps because of the whimsical associations made with wings and flying. A colorful, butterfly-shape mask is perfect for a butterfly costume, accented beautifully by color-coordinated hair streaks. Wear a flowing skirt and top and matching wings to complete the ensemble. For a bird costume, choose a mask with a beak and feathers, and coordinate the rest of your clothing around the colors and style of the mask. Your clothing need only be suggestive of a bird or butterfly. The mask will provide the most clues to your alternate identity.